Take a train to Dresden-Neustadt and then bus line 326 towards Radeburg to “Schloss Moritzburg”. Take the Freeway A4, exit Dresden-Wilder Mann (follow the signs) or the Freeway A13, exit Radeburg (follow the signs). Bus line 326 from railway station Dresden-Neustadt (towards Radeburg) to “Schloss Moritzburg”. The closest airport is Dresden which is 7 km away from Moritzburg. 28 Mar-3 Nov Daily 10:00 a.m.-05:30 p.m. Located in the middle of the Cultural Landscape of Moritzburg, about 15 km from Dresden, are the Baroque Moritzburg Castle which compound surrounded by a pond attracts thousands of visitors every year. Augustus the Strong, King of Poland and Elector of Saxony, had the representative hunting and pleasure lodge built on the walls of the former Renaissance building just outside Dresden’s gates. Not only the porcelain figurine collection of Augustus the Strong, but also the sumptuously painted and ornamented leather wallpapers represent part of Saxon history. A round walk of the castle in summer provides insight into the life at court then. The castle was converted in winter 1972/73 into a fairy-tale backdrop for the Czech-German coproduction of »Three Hazelnuts for Cinderella«. Nobody would have thought then that this movie would ever advance to become the most popular German fair-tale film. Meanwhile, this film itself has become part of the history of Moritzburg Castle. In the animal preserve you can pet wild animals of all kinds. The forest is in the immediate vicinity of the hunting lodge Moritzburg. The is especially nice for a family trip. This 3 star hotel in the historic Old Town district of Dresden is just 320 yards away from the Dresden Mitte Train Station. The rooms are brightly decorated and the internal restaurant offers German and international cuisine as well as a daily buffet for breakfast. The International Congress Center of Dresden and the Semper Opera House are within 10 minutes walking distance, as well as there is free parking at the hotel. A little outside Dresden, you will find this historical guest house set in amongst idyllically beautiful surroundings, with a friendly and professional service in a classy and sophisticated environment. 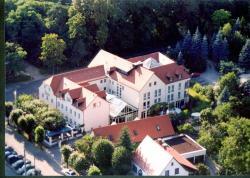 This 4-star hotel has a quiet location in the district of Radebeul, 7 km north of Dresden. Guests enjoy access to 2 restaurants and a garden terrace overlooking local vineyards.